Andragil's House is on Bravil's main island, above Dro'shanji's house in the eastern part of the island and opposite the Bravil Fighters Guild. In the entryway, a table against the short wall holds three apples. The closet holds a clutter sack and a chest that can contain healing potions. In the main room, another clutter sack and a grain sack sit against the other side of the short wall. The large table here holds three potatoes, two leeks, a cheese wedge, and a bottle of cheap wine. The table on one side of the fireplace holds another cheese wedge, and the cupboard on the other side contains clutter. Behind the room divider, a smaller table holds two heads of lettuce, a loaf of bread, a carrot, and a tomato. 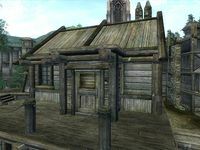 The bedroom in the southern corner holds only s single bed with an armor/weapons chest at the foot and a chest of drawers beside it containing clutter, with a nirnroot on top. The chest at the foot of the bed and the three sacks are the only containers in the house that do not respawn. Esta página foi modificada pela última vez à(s) 00h57min de 24 de janeiro de 2014.